Wishing all Indian friends here and everyone back in India a very happy independence day. Feeling patriotic today and was fully charged this morning, but they did not turned up. Our caption Rajeev called his colleagues to come our for a friendly cricket match this morning, but later they changed their plan and went to High commission of India for Independence Day celebrations. Almost everyone of our YPL was here and we had enjoyed some very good cricket. 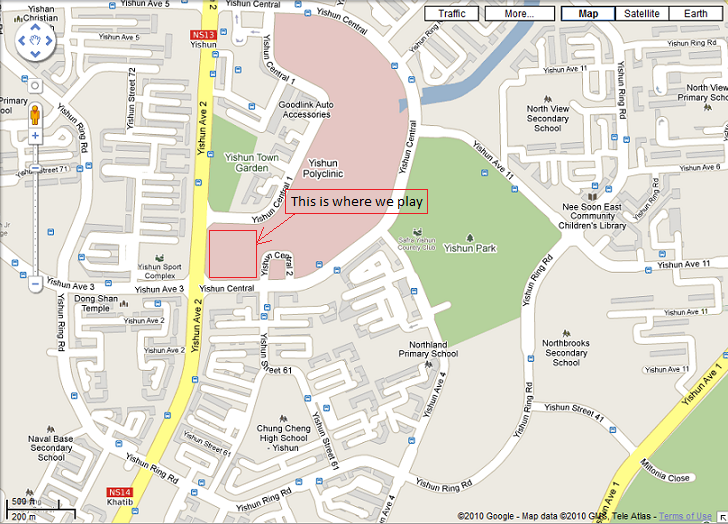 For those who are interested to play cricket can come to ground near Yishun Polyclinic. We are playing every Sunday and start at 7 AM. The ground is almost in middle Khatib and Yishun MRT and walk able from both, it will hardly take 15-20 minutes by walk to reach to ground. Here I am attaching a Google map for better reference. Well as you can find that word “Instinct” can be defined as “Inborn behavior”, means a behavioral pattern hardcoded genetically into DNA’s. Being a Bio student I will definitely agree with it and guess most of us also. Not sure how many of you will agree that we are aggressive or defensive, active or slow, sharp or dull, shy or extrovert, cleaver, intelligent or dumb by birth, but I do. Definitely education plays a very vital role in everyone’s life and most of the times our education system molds us in such a way that we can do well to our society and live a good life. But our instinct remains with us and keeps on popping up from time to time. Corporates have a defined culture and those who are in have to follow certain guidelines for their behavior, but still the instinct remains with us helps or hinders in our growth on corporate ladder. In general I will categories corporate employees in 3 broad categories, first are those lives a corporate life 24/7, second who remain on mask from 9-6 and you will find a different person all together in them after office hours and third are those who remain what they are 24/7. The best will be a correct mix of mask and instinct. This is the reason why there are only few keep on growing while other remains on more or less same place through out their career. Nowadays we will hardly find anyone belongs to category three but they still exist and I will say, “God bless them”. To those belong to first category I will say, “Dude! Your kids are too young to understand the complicated language you are using with them”. The younger generation which is on the way to join the workforce, its important for them to remain calm and keep looking around, explore new things use it and if it is not useful then just move on. Its time of rapid change and quick move, human will soon become a mechanical unit at work; no one is going to tolerate you if your negative instincts keep on popping up. Feeling great to share the work I have did so far. Given it a name MyBIG (abbr. My Big Image Gallery) and releasing its first version soon. Will release it under GNU General Public License. So need to go through it thoroughly before I take any action. There are other complications also, need to work on that.